NOTE: I no longer recommend Lumosity brain training. Unfortunately the Lumosity company has been plagued by numerous customer complaints. Worse yet, the U.S. Federal Trade Commission (FTC) fined Lumosity $2 million for deceptive practices. I think Lumosity management is trying to turn the company around, but the scandals left a bad taste in my mouth. Today my top recommendation for online brain training is NeuroNation, an up-and-coming German company specializing in cognitive training. NeuroNation has over 7,000,000 subscribers worldwide. Check out NeuroNation. If you like what you see, take advantage of my 25% Off Discount Coupon for NeuroNation Premium which unlocks all their games. 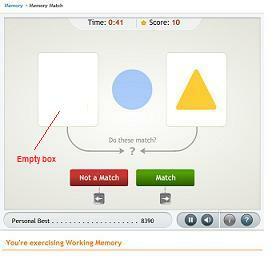 In my opinion, the best all-in-one brain training solution is at Lumosity.com. It's the only brain training service I use and recommend. I am not a paid affiliate of Lumosity. I do not receive payment or compensation from Lumosity for recommending their service. I just really like it a lot. Over 50 million people around the world subscribe to Lumosity, including me. You should try it! Lumosity brain games were designed by scientists. These games improve memory, concentration, thinking speed, problem-solving, and other brain skills. The Lumosity company has a special offer going currently. With just your name and email address, you can try Lumosity full-access brain training free for 3 days. No credit card is required for the 3-day free trial. Play their brain games regularly, and you should see a big jump in your measured brain skills as I did. All their brain games, courses, and progress reports are available in your web browser (Firefox, Internet Explorer, etc.). Log on and play whenever you want. Below are more examples of my own results, along with what you can expect. Percentages compare my brain skills to other users my age. Impressive now, but my scores were less than half this when I started! Of all the factors reviewed in a recent National Institute of Health (NIH) report, only cognitive training (i.e., brain games) was found to have a high level of evidence for decreasing the risk of cognitive decline. Lumosity brain training is the real deal. It has been presented at scientific conferences such as the Bay Area Neuroscience Gathering in San Francisco and the Society for Neuroscience conference in Atlanta, GA. Playing free brain games, like those here on Memory-Improvement-Tips.com, is fun and effective... but it's a hit-or-miss way to exercise your mental muscles. Scientific brain training is the best you can get. who understand how the brain works. 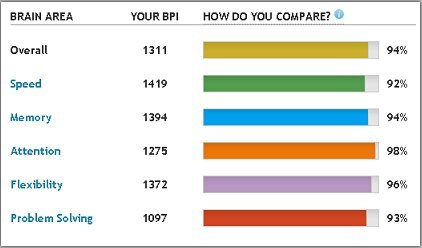 When I started, my score for memory tasks was "550" on the Lumosity Brain Performance Index (BPI) scale (see the graph at right). 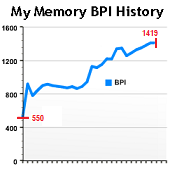 Today, my BPI for memory has more than doubled to 1,419. That's a 158% increase in memory ability. As you can see, with Lumosity I know exactly how much my brain is improving. How good is it, really? According to the company, over 98% of Lumosity users recommend Lumosity.com to friends and family. That's quite a testimonial in itself! Lumosity now has millions of members. It is the #1 cognitive fitness platform in the world. Each morning, I log on to my Lumosity account. The next brain training session is already waiting. I spend 15 minutes playing the 4 or 5 scientific brain games selected for me automatically. Each trains a different mental ability, such as working memory, problem-solving, or attention span. The games change from session to session. At the end of each game, I review my scores and my progress. Plus, I can repeat any game as many times as I want to for extra practice. Then I'm done. That's it! My brain training for the day is finished in just 15 minutes. During this 15-minute session, I work my way through each of the five games. Each game is on a timer. That forces an intense burst of concentration and mental effort. That mental effort is what strengthens my brain and makes it more powerful. After each game, I receive instant feedback on how well I performed. Statistics include reaction time, total missed and correct, my previous high score, and an evaluation of how much I improved. It's very logical, structured, and designed to maximize the improvement in my brain. These games are not easy! If they were, your mental skills would not be strengthened by playing them. Look at the Memory Match game at above, for example. It appears simple. Three shapes on the screen, does the shape in the left-hand box match the shape in the right-hand box? Simple, until you realize the left-hand box is empty. During the game, symbols flow from right to left then disappear as they move towards the left-hand box. You must hold the vanishing symbols in your working memory during the timed session. Scientific research has shown that working memory is closely linked to how intelligent you are, and that working memory can be improved. Strengthening your working memory not only strengthens your memory, it makes you smarter! And Memory Match is only one of dozens of scientifically designed brain games you get to play when you subscribe to Lumosity. If you pay on the annual plan, Lumosity costs only about $6.70 (U.S.) per month. It's a bargain, considering that your concentration and brain power affect everything you do. But because Lumosity might not be for everyone, you can try before you buy with the 3-day free trial. If you want your brain power to continue to grow, become a regular paid subscriber, like me! To sign up for the free trial of the premium version, go to their site and click the Get Started Now button. Create your account and personalized brain training plan, and then click the "Start Training" button.